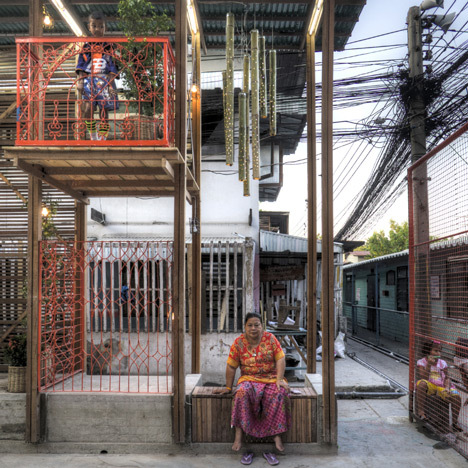 Architects TYIN Tegnestue of Norway have taken an empty slot in a dense residential area of Bangkok and worked with the local community to build a climbing frame and basketball court. A year of interviews, workshops and public meetings with the Klong Toey community allowed them to build the structure with the help of residents and students in only three weeks. It includes new hoops for basketball, a stage for performances and public meetings, walls for climbing and seating both inside and on the edges. The two-storey structure sits on top of a deep concrete block, which also acts as seating. Bright lights, recycled wood panels and patterned orange metal frames create a scaffold-like intervention with graffiti and other dwellings as the backdrop. Wooden stairs and walls allow children to climb up and down the construction and reach small platforms above. The playground was designed as an open, adaptable space so future communities can add and remove elements as required. See more work by TYIN tegnestue here. Klong Toey is currently the largest and oldest areas of informal dwellings in Bangkok. More than 140,000 people are estimated to live here, and most are living in sub-standard houses with few or no tenure rights or support from the government. The area has great social challenges mostly due to the lack of public services like healthcare, affordable education, sanitation and electricity. An extensive drug problem greatly affects the social climate followed by high unemployment rates, violence and crime. In addition to the main function as a football court and a public playground the project will work as a tool for the community to tackle some of the social issues in the area. A crucial factor in the continuation of the project is that the Klong Toey Community Lantern will be part of a long term strategy. This project is part of a development on a larger scale, and it has to be considered as a small contribution that might lead to positive change. With the local connection established both in the local community and a professional network in Thailand the project has greater chances of having a social sustainability. The year long preparation period allowed the team to design and build the structure in as little as three weeks. During this period the project team got involved with the community through interviews, workshops and public meetings. The design of the structure is a combination of many basic ideas and concepts, and embodies several of the features lacking in the area including new hoops for basketball, a stage for performances or public meetings, walls for climbing and seating both inside and around the edges of the playground. Space was limited on the site, and it was important to maintain the size of the football field. As a result of these limitations the footprint of the structure measures 12m x 1,2m and the full height of the building is short of 5 meters. Due to poor ground conditions a concrete base was cast to support the weight of the building. The main construction simplicity, repetitive logic and durability enables the local inhabitants to make adaptations that fit with their changing needs without endangering the projects structural strength or the general useability of the playground. This way the project runs in parallel with the ever changing surroundings and fits with the idea that the project could be part of a larger call for a more sustainable development in the Klong Toey area.